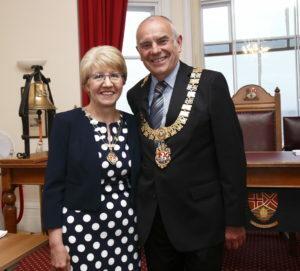 At its Annual Meeting of 16th May, the Town Council elected Councillor Graham, Newman as the Mayor of Felixstowe for the Municipal Year 2018/19. On the same evening Cllr Tracey Green was appointed as the Deputy Mayor. On accepting the office of Mayor, Cllr Graham Newman, who has been Member of the Town Council since 2009, said: ‘ I am humbled and privileged to have been elected by my fellow councillors to serve a second term as Mayor for this coming Civic Year, 2018/19. I am also delighted that my colleague Cllr Tracey Green – an established Town & District Councillor – has been elected Deputy Mayor. Having said that, I know I am stepping into huge boots left by my predecessor, Cllr Nick Barber, who has done a fantastic job over the past year – representing Felixstowe all over the County and beyond – and raising a huge amount of money for his three charities. So yes, 2018/19 will be a different type of mayoral year but I hope one which consolidates and builds upon the many aspects of our Town’s growing success. Equally I want to focus on supporting those who have yet to be touched by that success – for instance those facing the challenges daily such as loneliness and/or “where is the next £ coming from”. To that end, I will be supporting two charities that make it their business to help… The Laydens Community Café in Langley Avenue and The BASIC Life Charity. If you would like the Town Mayor to attend an event you may be organising please download and complete the Mayor Engagement Form and return to lorna.monsen@felixstowe.gov.uk. Read about the Mayor’s Charities here. A special church service is held to bless the new Mayor which distinguished guests from the local community are invited too. The new Mayor welcomes distinguished guests from the local community and announces the charity (or charities) they will be supporting during their term in office. A special Christmas Service for distinguished guests from the local community. In addition, the Mayor presents the Civic Awards .